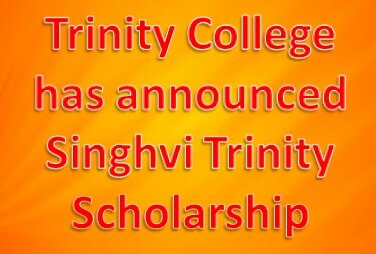 Trinity College has announced Singhvi Trinity Scholarship. An amount of Rs. 20 million is donated by a senior Congress leader Abhishek Manu Singhvi to the Trinity College, University of Cambridge. After this contribution, Trinity College has launched a scholarship named ‘Singhvi Trinity Scholarship’. Abhishek Manu Singhvi who is an alumnus of Trinity College where he obtained his law degree and also did his PhD in law in the 1980s has also become a founding member of the King’s Hall Circle by Trinity College. Through the contribution of Mr Singhvi, a scholarship for an undergraduate or postgraduate degree will be provided to the students at Trinity College. This scholarship will be valid for one year (liable to be renewed) and also awardable to students holding other financial need-based scholarships. Candidates have to be a resident in India at the time of application for admission in the undergraduate course. In the case of postgraduate course, they have been resident in India within at least the first of the two previous academic years. The scholarship will be awarded for every two years for an undergraduate and every three years for a postgraduate course. Previously in 2015, a personal donation of Rs. 11 Million had also given by Mr Singhvi a Rajya Sabha member to Anita Singhvi Prayas Center for destitute children in Delhi. Over 30 and 40 children between the ages of 8 years and 12 years who are completely destitute, abandoned, and orphaned are provided houses, food, education and comprehensive care for several years until they become self-independent.